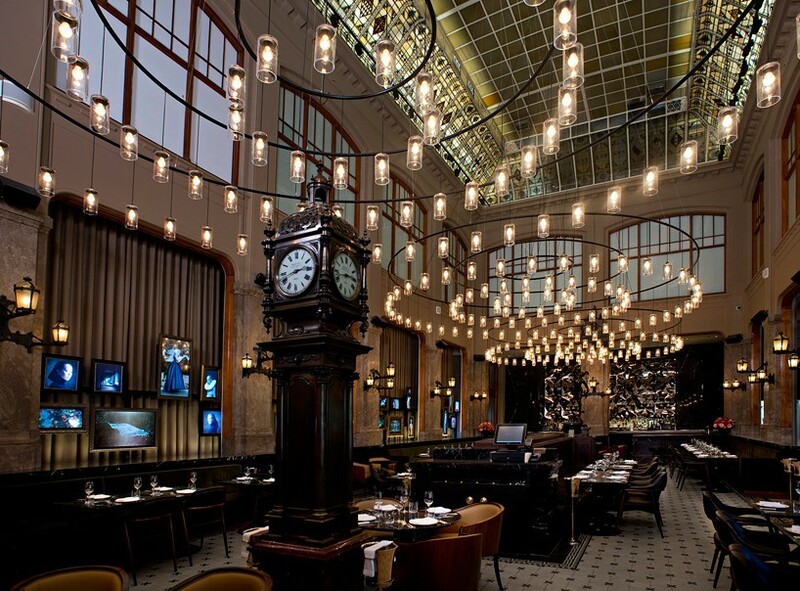 located within the renovated five-star W amsterdam hotel, the duchess restaurant is a baroque-style, viennese café-restaurant, which stands in the central hall of the former KAS bank building. baranowitz kronenberg was in charge of the transformation of the historical building which was formerly a telephone exchange building. meanwhile the restaurant capitalizes on the high ceilings by lowering the chandeliers to a modest height — a feature that creates a comfortable atmosphere among guests. the striking room provides visitors with a sweeping view of the upper floor and the menu itself is influenced by light flavors from southern france and italy. 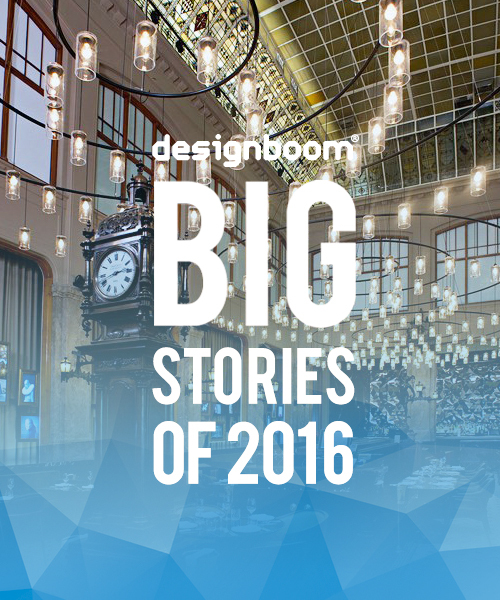 read more about the project and our interview with the architects on designboom here. potato head is a restaurant in hong kong designed by japanese architect sou fujimoto. the multi-purpose venue for the indonesian chain which comprises a retail area, a restaurant, and a coffee shop. 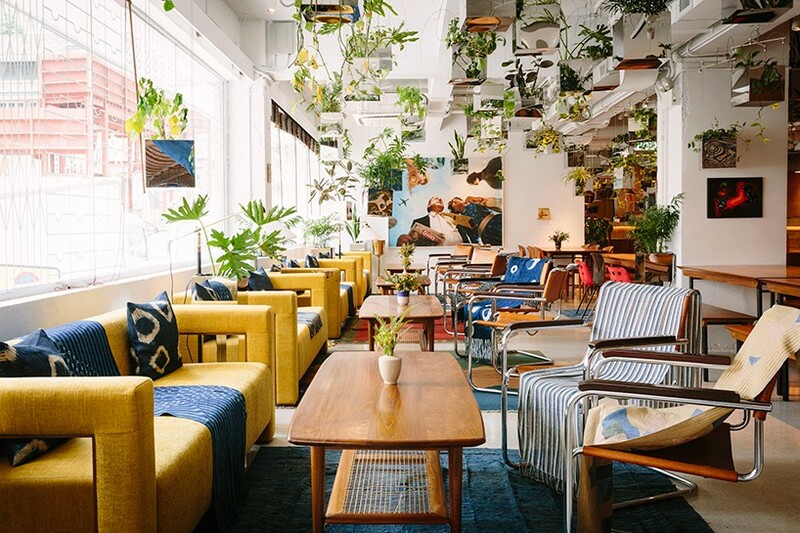 an inviting atmosphere is created, where locals are able to get coffee and shop for artisanal homeware while executives work in the lounge, and families dine at the restaurant. fujimoto’s stainless steel planters are suspended from the ceiling, establishing a ‘floating forest’ above an area of relaxed seating. here, indonesian furniture is mixed with mid-century and antique pieces, including marcel breur leather armchairs. 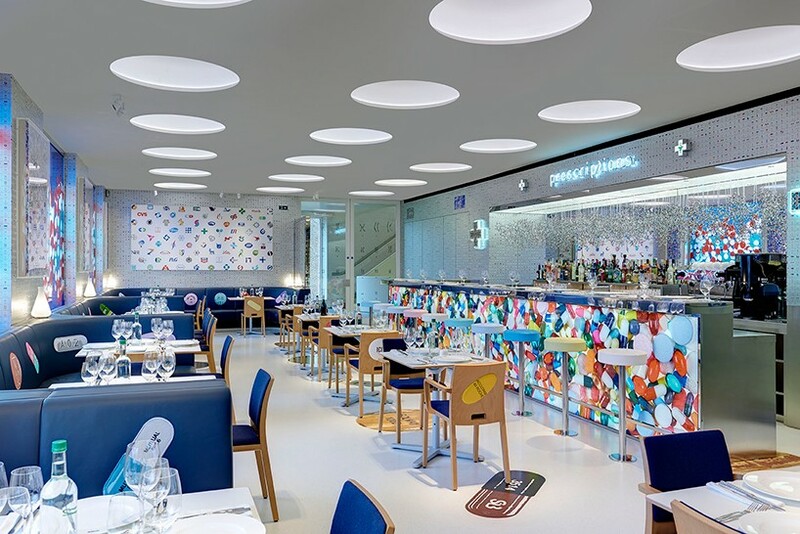 image © 2h restaurant ltd.
damien hirst teamed up with english chef mark hix on ‘pharmacy 2′, an art-themed restaurant at hirst’s newport street gallery in vauxhall, london which won this year’s RIBA stirling prize. 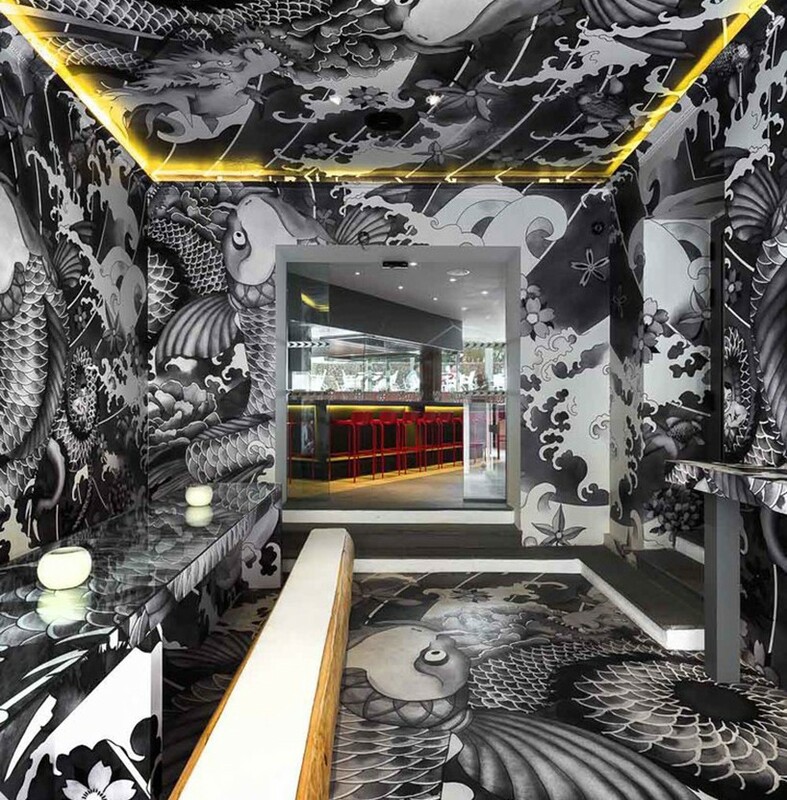 the restaurant features work from the artist’s most iconic series, including the ‘medicine cabinets’ and ‘butterfly kaleidoscope’ paintings, alongside etched glass windows depicting DNA strands, marble inlaid flooring and a bar that incorporates a stainless steel and glass vitrine. colorful pill graphics are embedded into the marble floor and embroidered onto leather banquettes. zhaoyang architects transformed an abandoned office complex into a farm-to-table restaurant and gallery in southwestern china. housed within timber structure, a bungalow made of brick and concrete, and a 200 square meter courtyard, the design team sought to redefine the courtyard’s four edges using different strategies. inside, there is a restaurant, a farmer’s market, a gallery for local craftspeople, and space for a weekly bazaar. 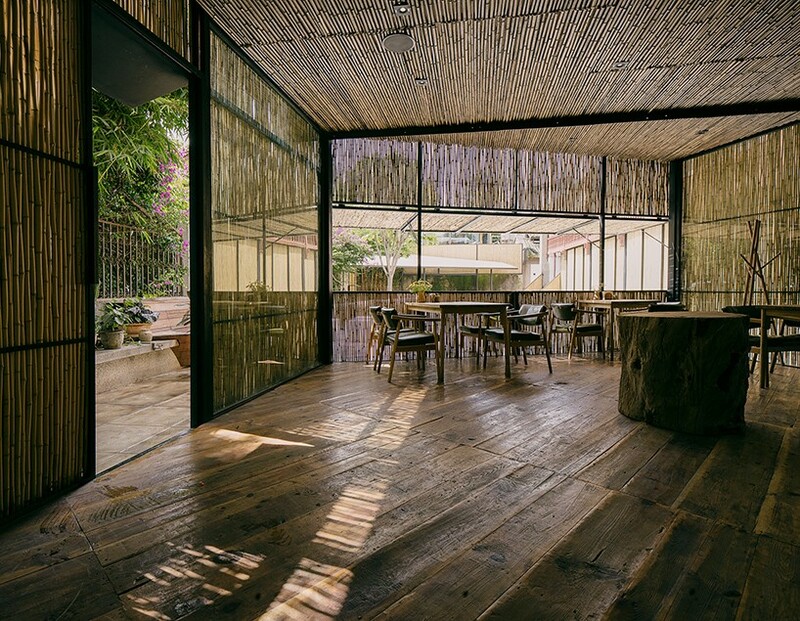 most distinctively, the pavilion that has been wrapped in bamboo, emphazing its volume and filters sunlight internally. see more about the project on designboom here. in myagi, tokyo, the nacrée restaurant features a whimsical interior design conceived by kengo kuma. the french restaurant is ran by a japanese chef who previously worked at a 3-star michelin restarant in france and the characteristic feature is the unconventional and transparent tubes that wraps and curves around the floorplan. 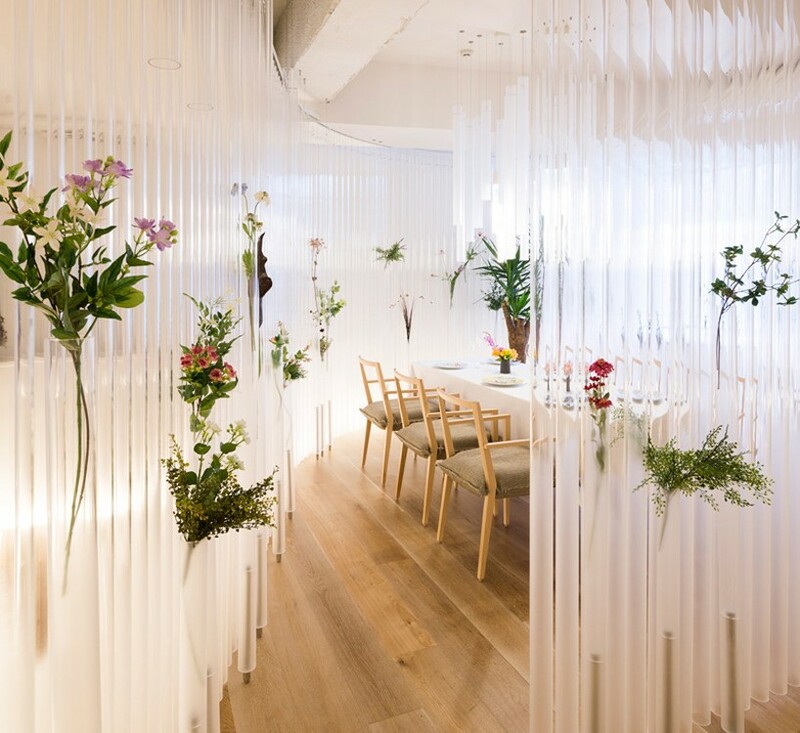 these acrylic cylinders suspend from the ceiling to create a transparent curtain and partitioning between different zones of the restaurant; their light opacity allow the decorative stems of flowers fixed in-between to be the focus, while diffusing artificial light. see the full project on designboom here. 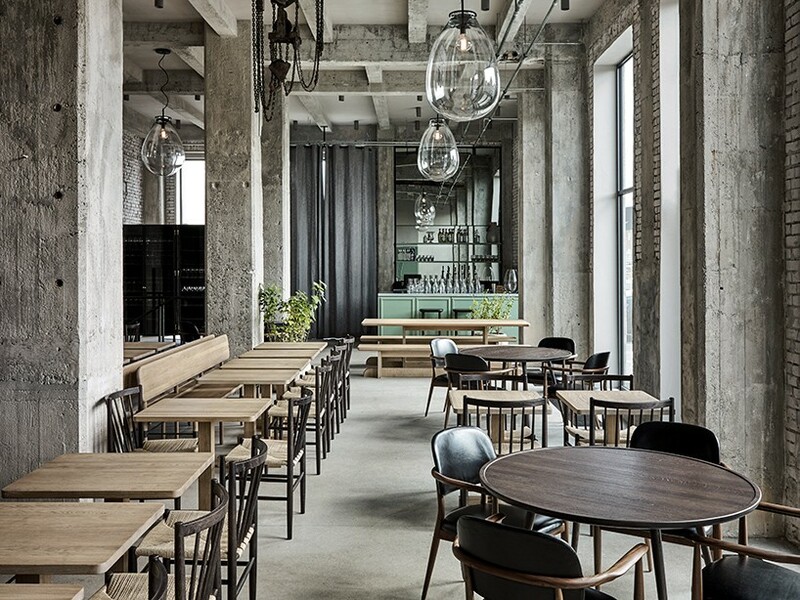 occupying a former industrial warehouse, ‘restaurant 108′ is a high-end eatery in the danish capital for chef rené redzepi. 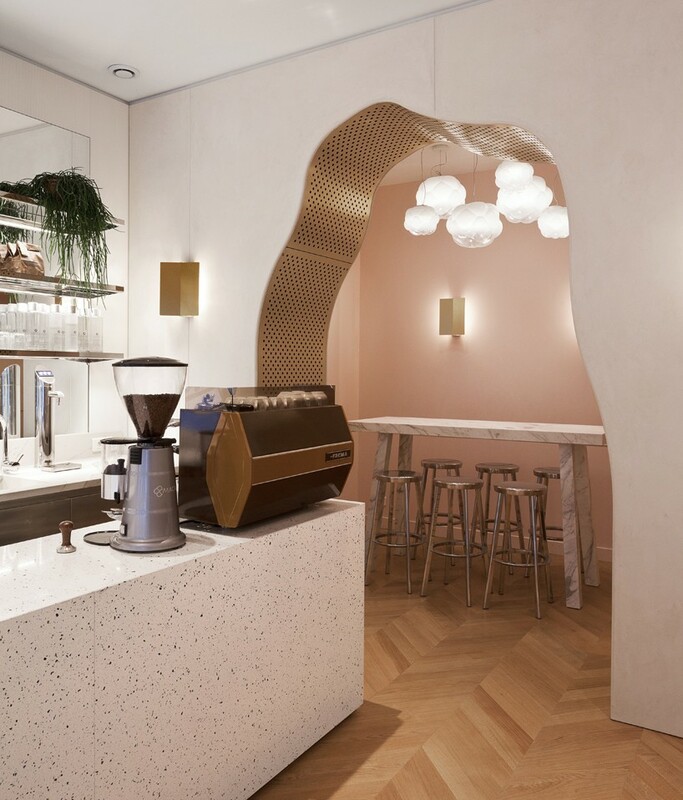 SPACE copenhagen‘s design combines the building’s existing structural elements with bespoke furniture pieces that offer a distinct scandinavian style. a sense of vibrancy is achieved through splashes of color. seafoam green and midnight blue contrast and complement the use of red, referencing the façades, bricks and roofs seen across copenhagen. mathieu lehanneur‘s the interiors of NOGLU offers local residents and visiting tourist the opportunity to discover gluten-free dishes and pastries within a welcoming environment that blends contemporary style with comfort and coziness. the boutique restaurant chain with a ‘gourmet gluten-free’ ethos is located in the 7th arrondissement of paris and to create a sense of indulgence, soft tactile furnishings with pale, gray velvet cushions were used. 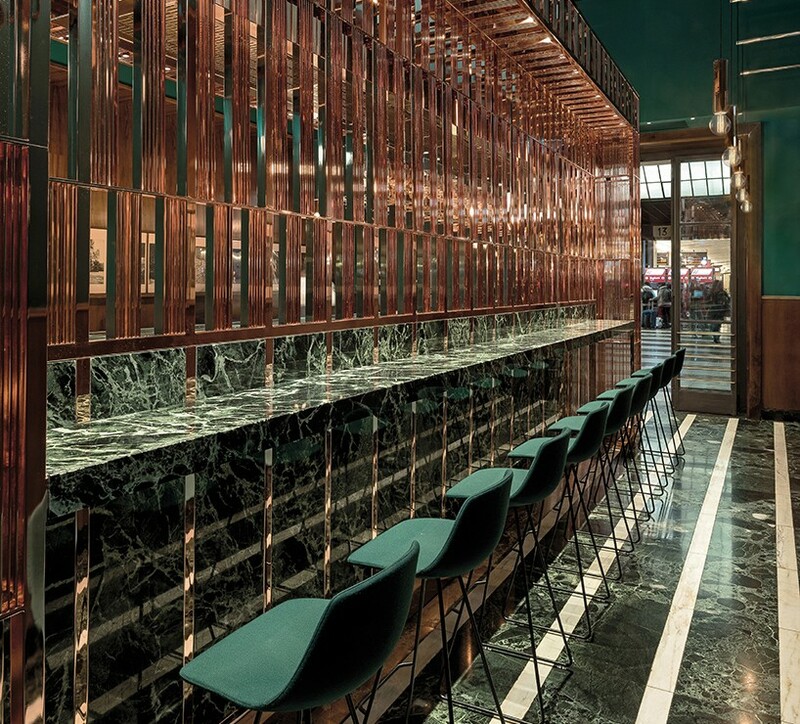 the terrazzo-topped tables and bar aim to make visitors feel relaxed and at home. designed by COLLIDANIELARCHITETTO, ‘VyTA santa margherita’ is located in florence, inside a former first class waiting room of the santa maria novella train station. the defining features of the project are the antique materials and the fine finish that characterize the original purpose of the space. 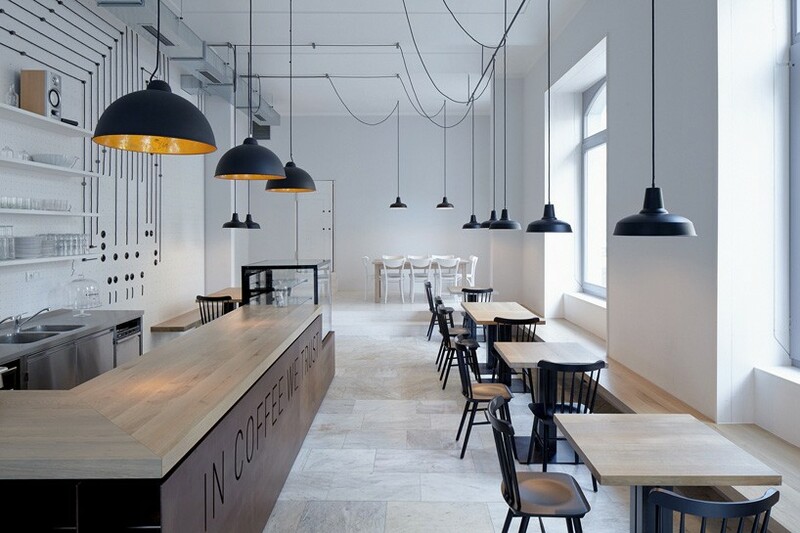 ine materials such as copper, glass, and marble, interface with the existing historic features giving life to a luxurious bakery.